Eventually, the manhole cover gave way and the connection to the surrounding road was destroyed. A solution was required, so DENSO's road construction specialists developed DENSOLASTIC®-EM. The product was the first artificial mortar able to cope with extreme loads. It acts like a buffer between rigid elements, absorbing vibration without being damaged by it. What's more, the product is easy to apply without the need for special tools, and hardens rapidly within one hour — keeping traffic disruption to an absolute minimum. 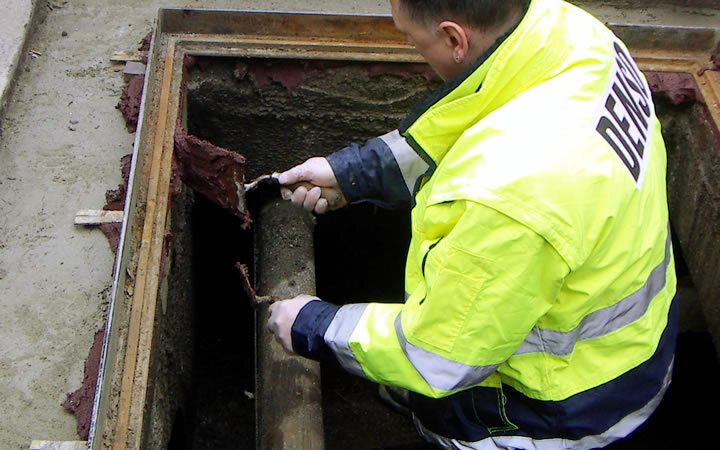 The Cologne water authorities trialled DENSOLASTIC®-EM on Freimersdorfer Weg and reviewed the condition of the manhole cover at regular intervals over the subsequent years. Even 15 years later, the official checks showed that the cover was still securely in place and the joint mortar was still absorbing all road vibration! A DENSO success story: Thanks to DENSOLASTIC®-EM, an expensive annual program of roadworks has been replaced with year-round unhindered flowing traffic.